With a plethora of shows opening in Richmond this weekend, I still had to add some more insanity to my life by scheduling one more show from my bucket list. I have wanted to see The Addams Family (the musical) since it opened on Broadway in 2010 with my college friend Carolee Carmello (yes I just name-dropped). The musical contains the familiar creepy and kooky characters that first appeared in cartoons by Charles Addams for the New Yorker Magazine in 1938 and have gone on for every generation since, in a 1960′s TV series, 1970′s cartoons, and 1990′s movies. In the musical, Gomez and Morticia most closely resemble the characters as portrayed in the movies by Raul Julia and Anjelica Huston. There is shtick and sight gags, plays on words, dark humor and all the other eccentricities that have kept these characters going for four generations. The truest test of its entertainment potential for me, was my teenage son enjoyed it just as much as I did (he kept telling me how funny it was and kept pointing out how well done many areas of the show were — I guess I am training a future critic). There are some updates to the story. The Addams now live on two acres in Central Park in New York City. Little Wednesday is now all grown up and wants to get married into a “normal” family from Ohio; but how will she get the two families to get along? While the story is simple, the special effects are extraordinary; with puppets and zombies and even a flying Uncle Fester. Of course there’s Cousin Itt and another “thing” or two. Among the talented cast, Jennifer Fogarty stands out as Wednesday, with her dead-pan voice and face and gorgeous vocals. Jesse Sharp (Gomez) and Shaun Rice (Fester) turn in strong comedic performances, with expert timing. 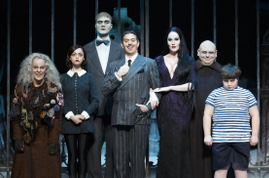 While I am a stalwart advocate for supporting the local theaters; I also feel that national tours like The Addams Family as a part of the five-year-old Broadway in Richmond program are a valuable asset to the local arts scene. With just two performances left, I hope the seats are filled for this highly entertaining and lighthearted production. It will leave you wondering how’d they do that? Disclaimer: Broadway in Richmond provided two complimentary media tickets to ShowBizRadio for this review. This article can be linked to as: http://showbizradio.com/go/9928.